I’ve been collecting labradorite for years. It is a beautiful and mysterious stone which, at first, appealed only to my eye. But when I learned of its healing qualities as well I realized that I was drawn to it because of the way it also spoke to my heart. I have labradorite in almost every room of the house. Wherever we travel I look for a piece, either in jewelry or a rough or polished stone, to bring home with me. It’s only been on the rare occasion that I haven’t been able to find it. The stone depicted is one I purchased in a rock shop in Banff, Alberta. I always gravitate to the labradorite section of such a shop (in Banff there are many). 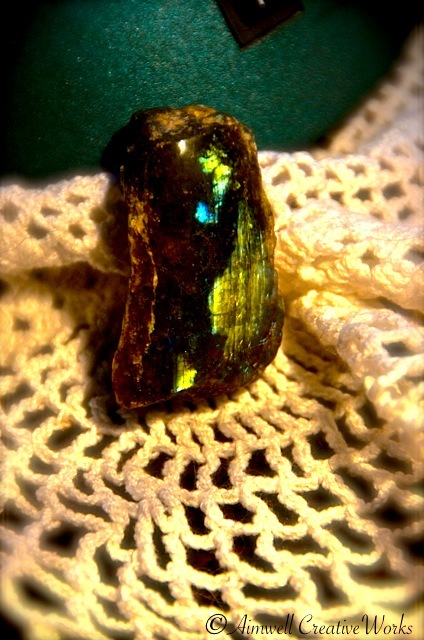 Unless a person is aware of the qualities of the labradorite they’ll usually just walk by it because at first glance it looks like a grey stone with a bit of colour in it. But it is so much more. I will spend several minutes oohing and aahing over each stone that tempts my eye. I will pick them up one at a time, cradle it, hold it to the light and watch as the stone comes to life, the luminescent colours dancing and playing between peacock blue and green and mauve or orange or whatever its particular essence holds. It’s totally mesmerizing. I am a child again, searching for special rocks in a mountain riverbed that I can take home and add to my ever-growing collection. In this shop I inspected a number of stunning pieces of various sizes and opted for this one because I liked that it was polished on one side and rough on the other. It’s about two inches high by one inch wide and another inch deep and can be held comfortably in my hand. As I didn’t have one like this in my collection I decided it would come home with me. I think it, along with another stone I selected, cost about $40. Now it’s priceless to me. It wasn’t until I got it home to Ontario and had a proper opportunity to inspect and meditate on it that I realized what an incredible find this was for me. In fact, I have thought since that it wasn’t so much that I found the stone but that it found me. I discovered that when I look at the polished side of the stone at a particular angle under a light source the impression of the head, neck, shoulder, chest and a raised front foot of a horse magically appear. If you look at the image here you’ll see it. I had to set the stone up carefully against the base of my desk lamp and cradle it with a lace doily to make it work, but it is clearly visible. Maybe you won’t see it right away, but it’s there. For reference, the nose of the horse is blue. When I first noticed this it took my breath away. My passion has always been horses. Horses are an important part of my life journey. I couldn’t believe that a simple stone I’d picked up for one reason ~ its appeal to my eyes alone ~ actually spoke to me at a much deeper and more spiritual level. So, as you might imagine, what might seem an incredibly boring chunk of Mother Earth to one person is actually a treasured piece of her inner beauty to me. Perhaps this simple stone also illustrates the notion that beauty is not always obvious and is to be found in the most unusual places. All we need to do is open our eyes, and heart, and see it. This entry was posted in Alberta, Canada, Daily Post, Inspiration, Life, Musings, Nature, Photography, Shout Outs, Travel, Uncategorized, Weekly Photo Challenge, Writing and tagged Aimwell CreativeWorks, Alberta, Daily Prompt, Dorothy Chiotti, Equestrian, Equine image, Horses, Inner beauty, inspiration, labradorite, Light and shadow, Mother Nature, mountains, Photography, postaday, Sacred spaces, Travel, Weekly Photo Challenge. Bookmark the permalink.